I have read and enjoyed several Harlequin Historicals over the past couple of years so when I was browsing on Netgalley and spotted this one I decided to take a look. After reading the blurb and the short snippet provided I went ahead and requested it. 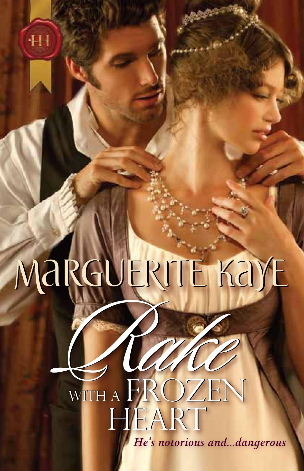 Rake With a Frozen Heart gave me an entertaining read that didn’t quite fit the mold of most historicals set during this time period. I found myself looking for and enjoying those differences. I am not a history buff so any possible inaccuracies didn’t bother me at all. Henrietta’s entire character provoked me into laughing out loud several times as I was reading. She was delightfully blunt and opinionated and had this habit of almost talking while she was thinking so nothing was hidden. Her naiveté was explained rather nicely as we learned about her upbringing so it fit. I didn’t have any real quibbles about how someone could have remained so completely innocent. One of the things I liked is that unlike the typical governess heroine she didn’t encounter her hero at a house party nor did she meet him when he rescued her from the unwanted advances of another nobleman but after their initial meeting she unknowingly stowed away on his phaeton as she tried to escape to London and then their adventure really begins. Rafe was also something else. I didn’t completely buy his altruism in helping Henrietta discover the truth about the stolen jewels but given his complete desire to avoid his grandmother’s pressure to re-marry I could see that he welcomed a distraction. He was quite a contradiction on one hand bound and determined to do the right thing but refusing without refusing to re-marry and produce an heir. Possessing the reputation of a rake and yet hurt when called one by Henrietta. Ever the fashionable gentleman but heavily involved in activities no proper gentleman should ever contemplate. Watching the interaction between Rafe and Henrietta was a lot of fun. Their circumstanced in London allowed the slow growth of their relationship with each other and made it believable. The stark contrast between their sexual tension and the innocence with which Henrietta viewed London was enjoyable to read. Rafe did not keep his attraction to her a secret but he also resisted and would stop their physical exploration long before Henrietta considered really stopping. As enjoyable as reading Rake With a Frozen Heart was I did have a few issues with it. Occasionally Ms Kaye did use a turn of phrase that would pull me from her world as I puzzled over the words trying to create the image I think she was trying to portray in my head. I was also able to predict their reunion scene which did work but like I said earlier I enjoyed the differences from typical historical romances. The other thing that I think detracted is the amount of information covered in the epilogue. I typically enjoy epilogues but this was almost like a solution to keep from going over the word count while still providing closure to the reader. I wish some of it had been integrated in the novel itself. Despite those I did this and recommend it as a different flavor on the 1800’s romance provided you don’t require historical accuracy. Nice review, a new author to me. I’ve read a couple of Kaye books and novellas, mostly her Sheikh ones, she writes incredibly descriptive desert scenes, like you’re standing on the dunes. Really impressive and beautiful. I love a good Regency and I like her style, I’ll check this one out! I love it when an author can make you laugh out loud! And since I love historical romances this sounds great. Nice review! @Heller: This was the first one I had read by Ms Kaye but I don’t think it will be the last. Sounds like she has some other good ones out there. @Lexi: I hope you enjoy it :). Like I said this didn’t quite fit the mold of most historical romances that I have read and that was in a good way.